Looks like all my 50 Shades of Grey jokes are more accurate than I thought! Beware, those Chargers will ruin your credit score! D-D-D-D-Doom Trip!!! And we don’t mean the video game Doom, though a BFG might come in handy in case of Godzilla attacks. When last we left Big G, he and the Fantastic Four were duking it out in a museum, and The Thing had just knocked Godzilla into a shark tank. The sharks do nothing, especially not to The Thing, who also drops in the tank. Mr. 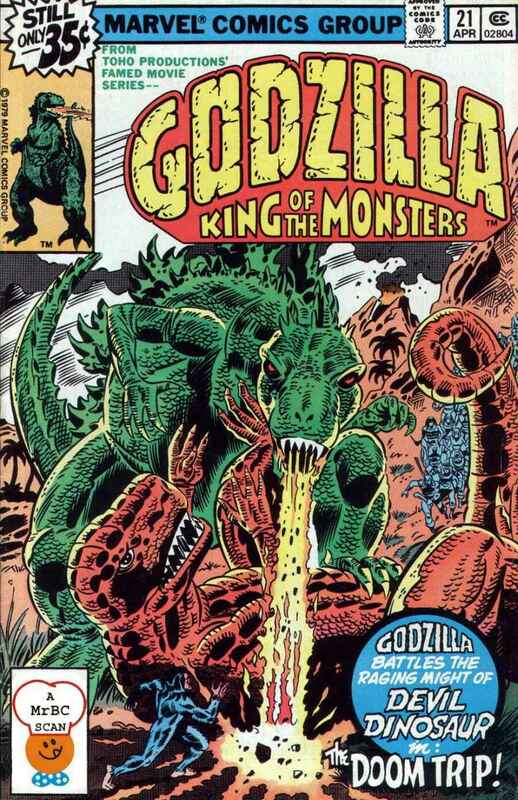 Fantastic wraps around and smothers Godzilla until he’s unconscious. Which is sort of disgusting when you think about it, and also sort of creepy. 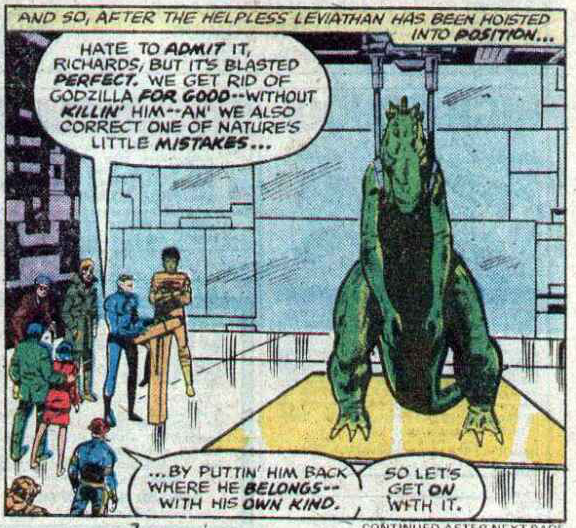 They tie Godzilla to the Fantasiticar and fly him to the Baxter Building. 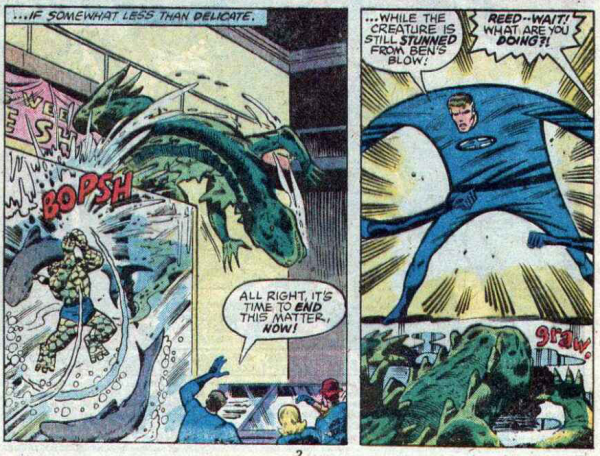 Mr. Fantastic’s big idea is to use Dr. Doom’s time machine and send Godzilla back to the past where he belongs – 900 million years in the past to the Mesozoic age! This is totally wrong! The Mesozoic Age was 252 to 66 million years ago! Reed Richards should know that 900 million years ago was the Tonian Period of the Neoproterozoic Era! The Tonian Era featured unicellular bacteria and fungi, but also had multicellular algae. So basically Godzilla will be very bored. 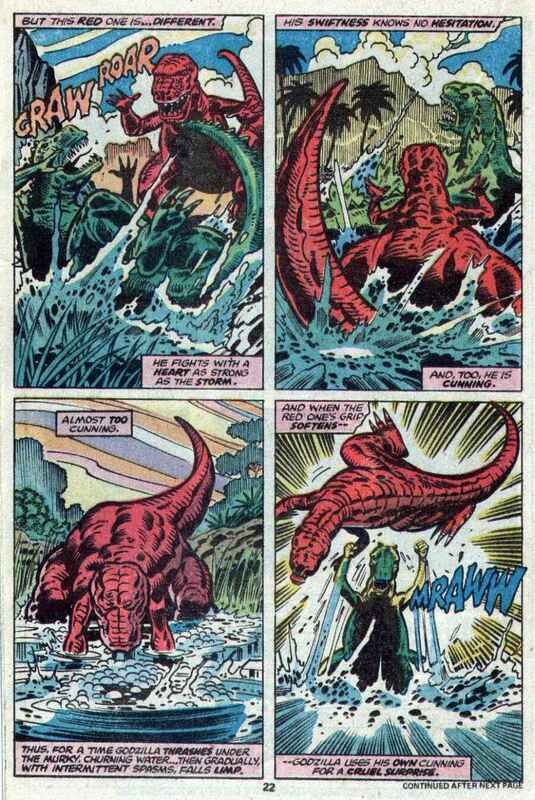 Luckily Reed Richards is as bad at programming the time machine as he is at knowing about ancient geological eras of Earth, and luckily does dump Godzilla during the Mesozoic Age. 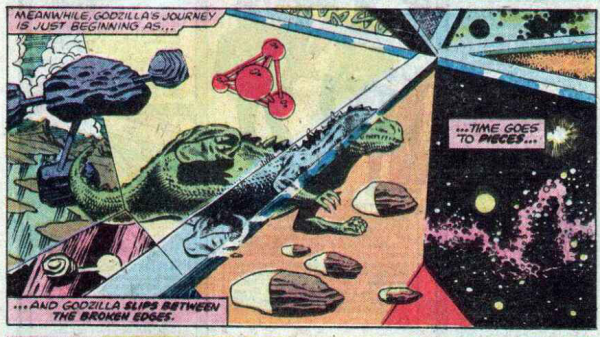 I can only credit Dr. Doom having an idiot-proof time machine control console. Feral He-Man characters threaten the future of the past! 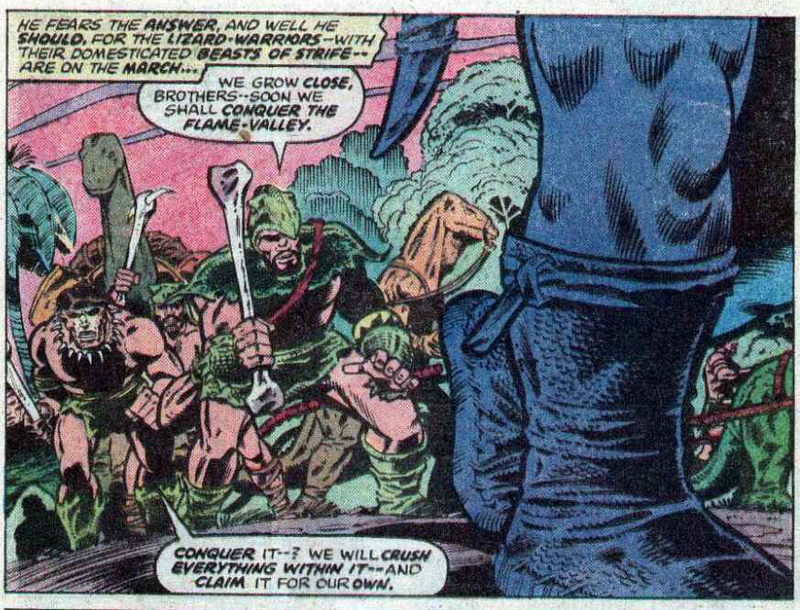 But the Lizard-Warriors (mean cave dudes) are on the march, trying to conquer Flame Valley with their Beasts of Strife. 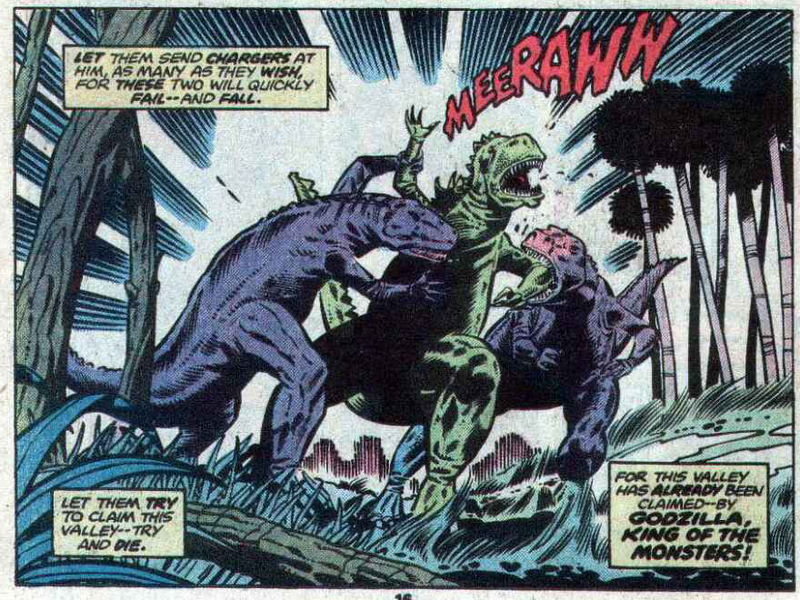 They send two purple tyrannosaurids called Chargers to attack Big G, just because they’re mean. Moon Boy and Devil Dinosaur hear the commotion and go investigate. Moon Boy sees Godzilla use his atomic breath and declares him a demon, and sends Devil Dinosaur to fight him. even though he just saw Godzilla fight his common enemy. Godzilla and Devil Dinosaur battle and fight, but then the Lizard-Warriors invade, and Moon Boy convinces Devil Dinosaur to make peace and attack the real villains. Way to be several pages behind, Moon Boy, but at least you got it right in the end. Godzilla goes along with this because Moon Boy is similar to Rob, which means that any young boy can convince Godzilla to do all sorts of stuff. And here we thought it was Gamera that was friend to all children. As the invaders close in, we to be continued! Next month will have lots and lots of dinosaur fights! It’s like you’re three and playing with your toys again, but in drawn on comic strips form! It is Marvel Law that two characters must fight before teaming up against the real threat. No! Reed! You sick pervert! 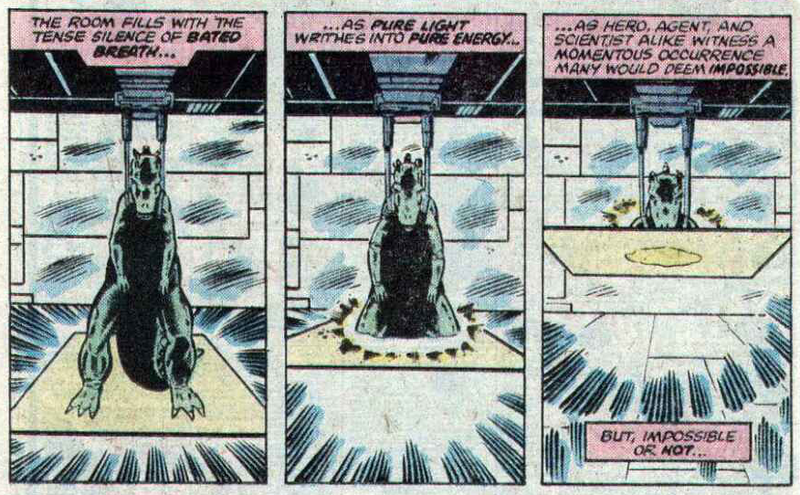 In the Marvel Universe, why anyone would consider anything impossible is anyone’s guess. One might say it would be impossible. Nice of the pieces of time to have such well defined edges and even a handy border constructed out of crystal. 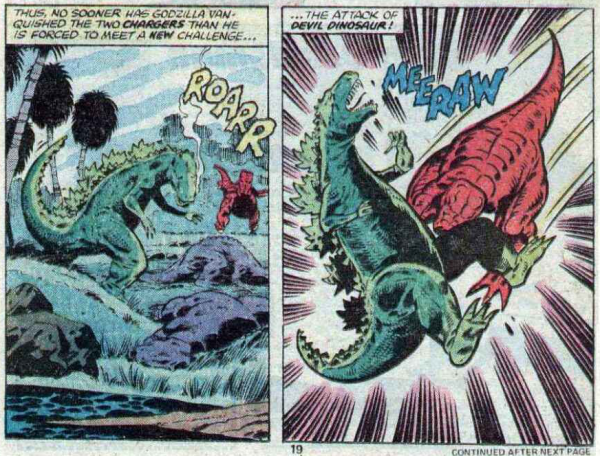 It is good all the dinosaurs are color-coded to prevent confusion, right Devil Dinosaur? The battle rages on so long, the real battle against the villains cannot start until next month!